While it’s fact that my red afro curls and pale, freckled skin boast Irish roots, there also are some mysterious Austrian ones hiding in this thin frame somewhere. 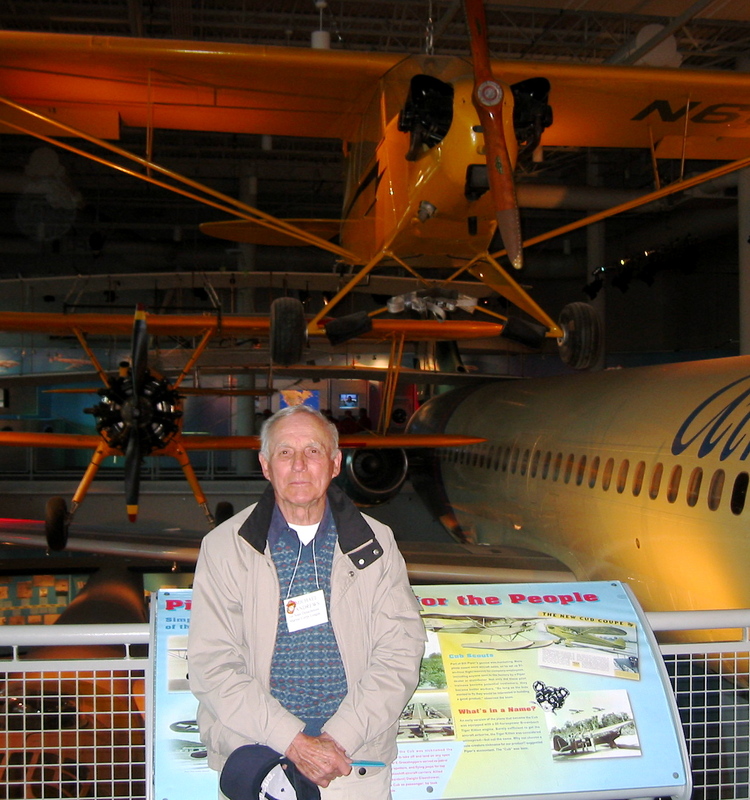 My grandfather is a first-generation Austrian-American, and while he doesn’t know much about our family history—much to our chagrin—it didn’t stop my mom and me from making up magical stories about our unknown roots (yes, talk of vampires was bandied about…this was pre-saccharine Twilight craze, don’t judge!). However, there are two things from this side of my family that have been forever ingrained in my curious mind. First, and probably more salacious, is that they owned a speakeasy in the heart of Baltimore. Having been to magical places like the Green Mill, Al Capone’s infamous haunt, I would give my whole shoe collection to have seen my great grandparent’s place. There’s something about that time period—the clothes, the music, the atmosphere—that reminds me that I’m an old soul. I picture blaring jazz music, sleek cherry wood bars and snifters of brandy. 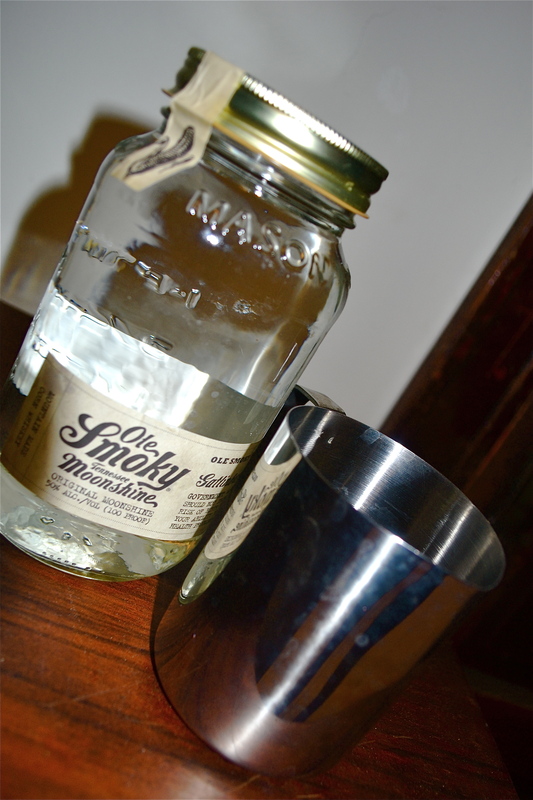 The smell of pipes and the smoky bar haze transport me immediately. And while I’ve never seen it, I can picture it quite perfectly. The second distinct memory of my great-grandparents was that they owned a bakery. I can only imagine it was a quiet, calming retreat from the bustling, and stressful, bar nights. Both my mom and my grandfather said that when my great grandmother was in the kitchen, you knew. The smell of donuts fresh out of the oven washed over the entire room. The way they described it sounded nothing short of life changing. And while my grandfather sadly doesn’t have the family recipes, he’s quite the baker himself. Around Christmas he hangs up his long-brimmed hat and outdoor workbench and opts for the kitchen. Many holidays have I found him exactly where I left him hours before, just with more flour and powdered sugar on himself. Delicious nut rolls and warm prune tarts are a Christmas morning (and many mornings after) tradition. There is something about the smell of pastries and warm, rising dough that reminds me of the holidays. It awakens the urge to blanket everything in powdered sugar. But another tradition of my grandfather’s, if you could call it one, was his Saturday French toast. It was always a marvelous weekend surprise to be woken up not by a blaring alarm but by the inviting smells of melting butter and bubbling, syrup-laden French toast. And now, when those few but lucky trips home happen, French toast is almost always an unspoken promise. So as I think about Father’s Day and the fantastic moments I’ve had with my grandfather—learning to drive the boat, catching my first flounder, and him playing prince charming to my sleeping beauty in one family home video—I feel the overwhelming need to blend the visceral imagery of my great-grandparents, their rousing speakeasy and speechless pastries with my grandfather’s passionate baking traditions in hopes that I will one day create a tradition of my own that melds together the one thing I hold most dear in this world—family. So an ode to the man who helped raise me, taught me much and has been a supportive rock and shoulder when I’ve needed it…and whose silent passion for the kitchen hasn’t gone unnoticed. I wish him—and all those other fathers out there, accidental or otherwise—a very Happy Father’s Day. I bring you a melding of my grandfather’s family traditions to warm your heart and quell your morning sugar pangs. 2. Butter a large pyrex dish. 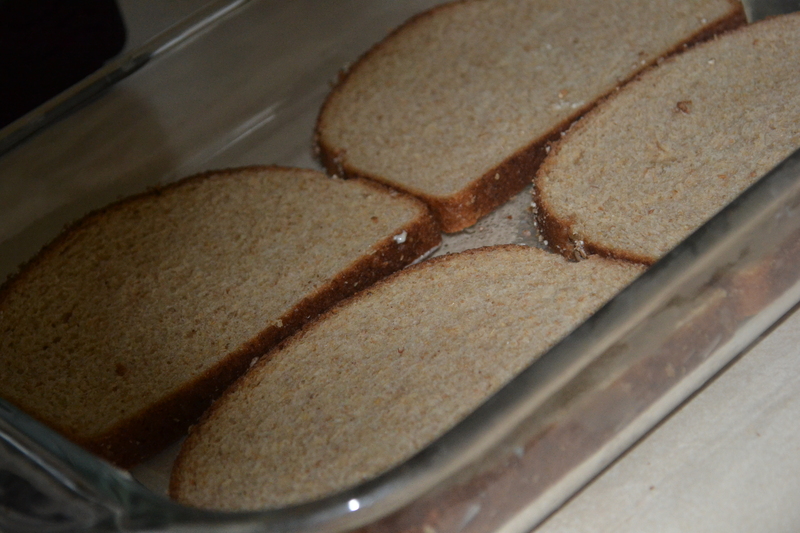 Place bread in the dish and butter each piece of bread (make sure you don’t overlap). 3. 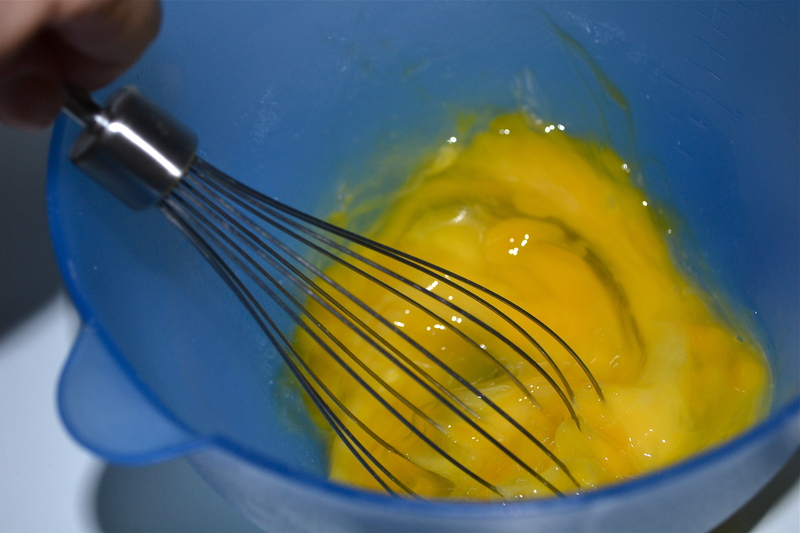 In a bowl whisk the eggs. 4. Then add milk, vanilla extract, ground ginger, cinnamon, cloves and salt. 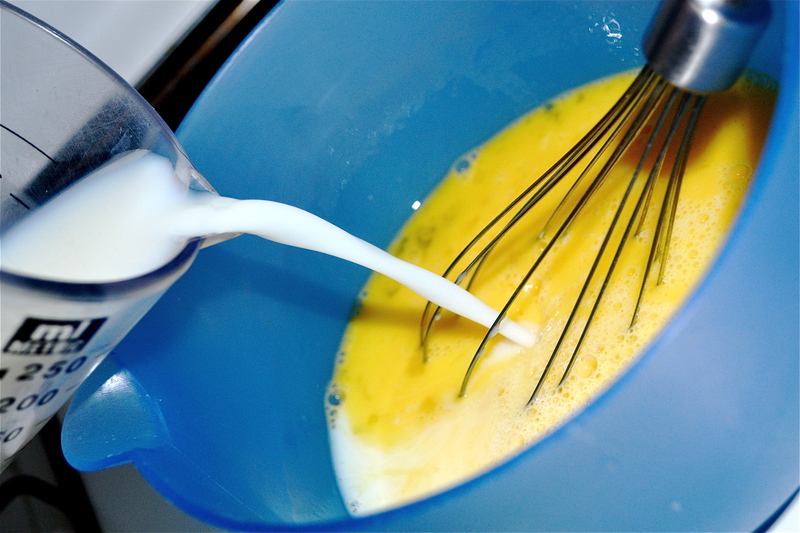 Whisk until foamy. 5. Pour the mixture over the bread. Flip the bread over every 10 minutes until each piece is fully soaked. This should take about 20-30 minutes depending on the type of bread. 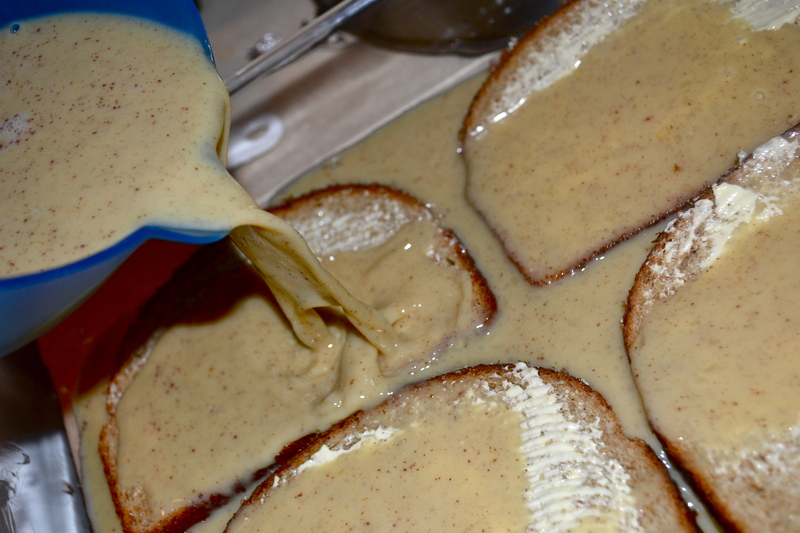 Make sure there is just enough liquid in the bottom of the dish and the bread isn’t immersed. Pour some extra liquid out if it looks like too much. 6. 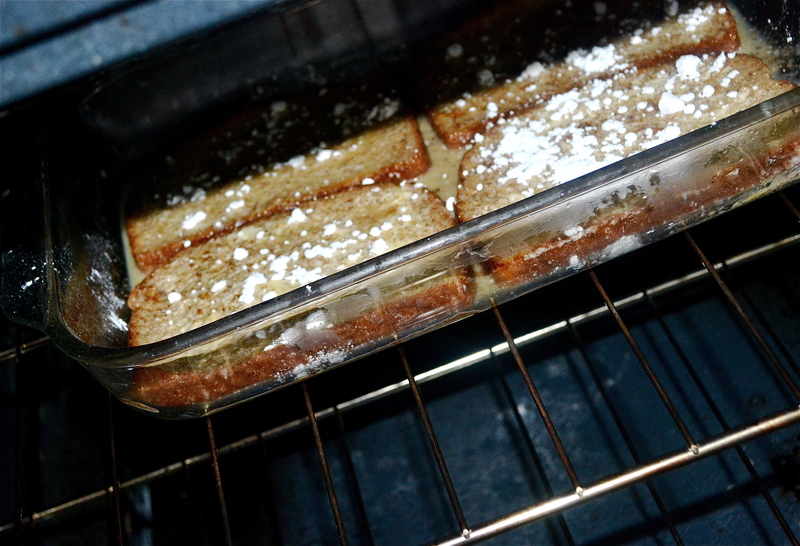 Sprinkle some powdered sugar over the bread and put it in the oven for about 30-40 minutes. I recommend making the oven a broiler so the bread is a little more crispy. I didn’t do this and the french toast turned out nicely, but I realized that I would have liked it a little less soft and a bit more sturdy. Perhaps broil the bread 5-10 minutes before it’s completely cooked so it gets a nice, crispy consistency. When I woke up this morning, visions of different sauce recipes danced in my head. 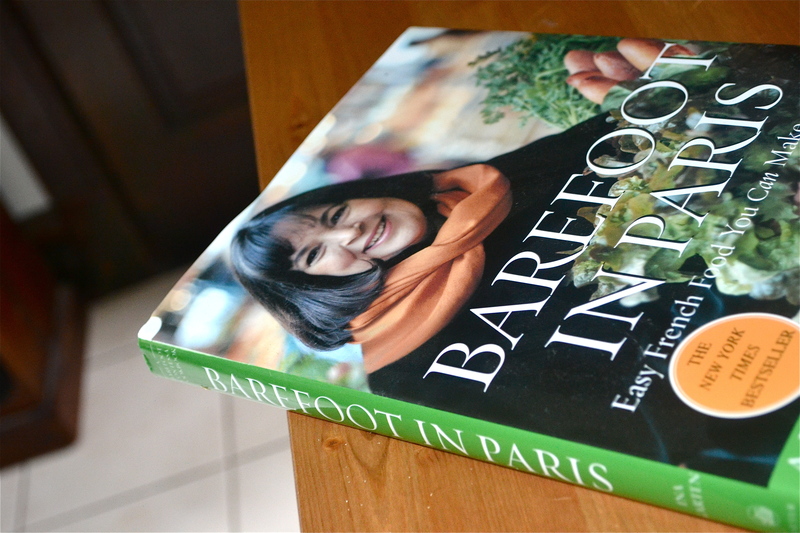 That’s when I pulled out the Barefoot Contessa for advice. 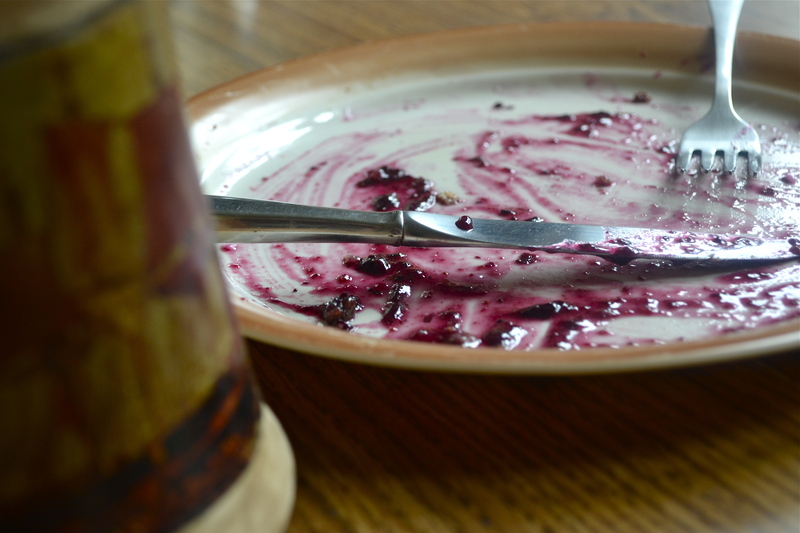 I found a gorgeous raspberry sauce that I knew I could easily play with and replace the raspberries with blueberries and her recommended liquor with the sweet taste of brandy. What happened was nothing short of magical. 9. 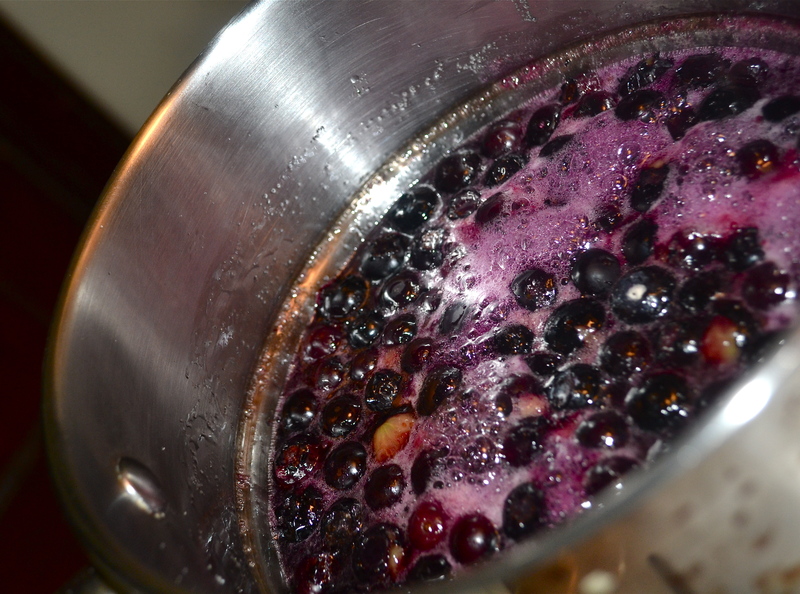 Place the blueberries, sugar and 1/4 cup of water into a saucepan. Bring to a boil, then lower the heat and simmer for about 4 minutes. 10. 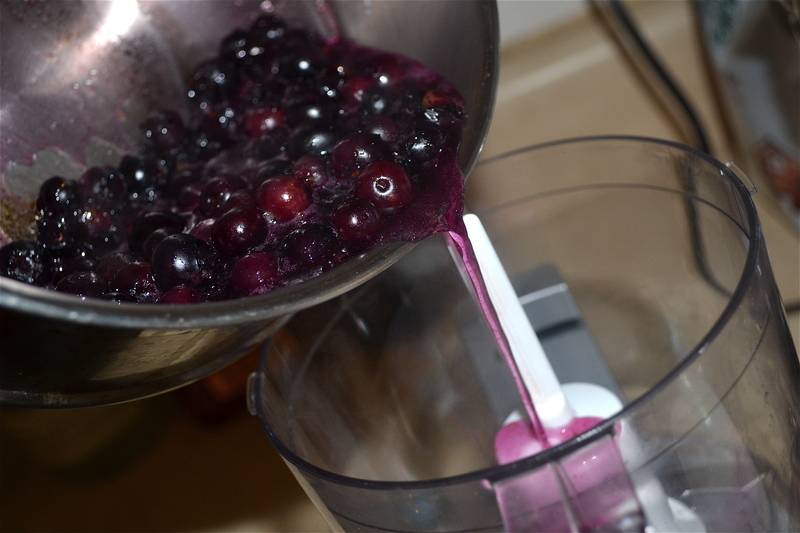 Pour the cooked blueberries, the blueberry jam and the brandy into a food processor. I used a brandy that was recommended as being a bit sweeter and perfect for baking (turns out, it was perfection!). 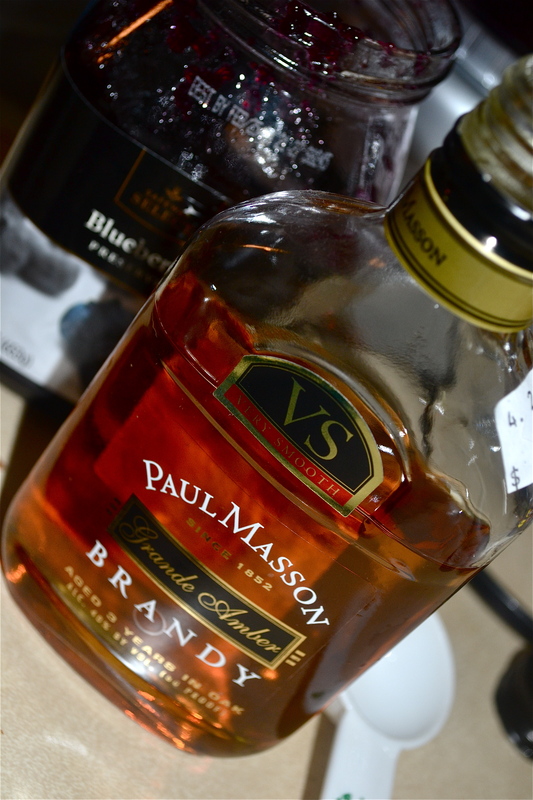 I also recommend adding the brandy and then sampling (you know you want to) so you have a nice ratio of sweet blueberries to smooth, supple brandy. 11. Process everything until smooth. Chill. 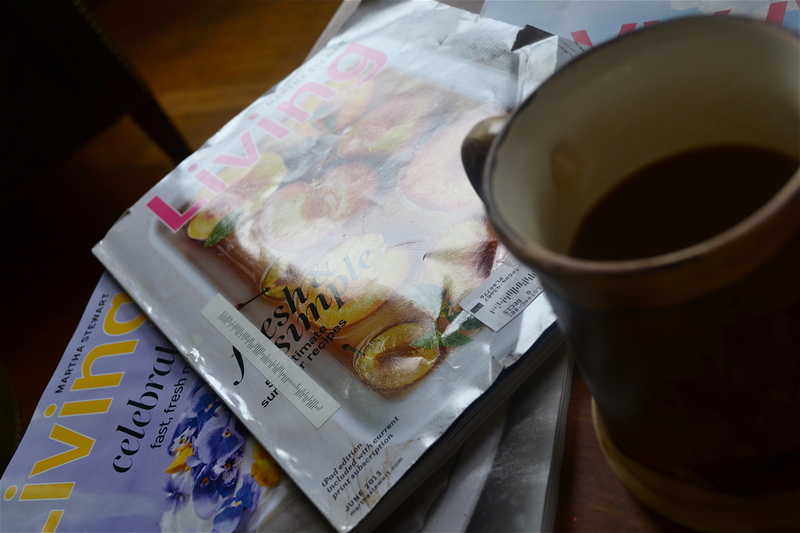 I was amazed how easy this sauce recipe was and I still had enough time to guzzle my morning cup of coffee, clean up the dishes and my kitchen workspace, and enjoy some leisurely magazine reading (which rarely happens). I admit I peeked a couple times to check on the french toast (I’m a bit impatient). 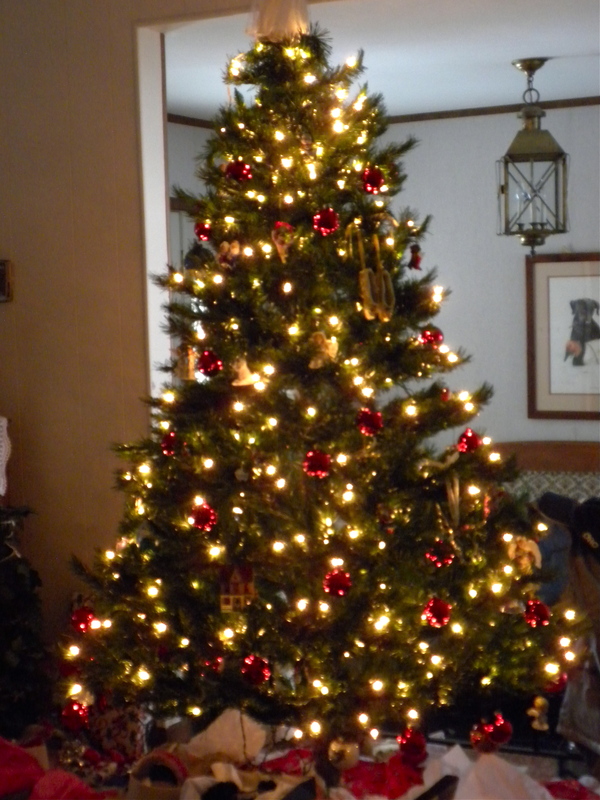 And the best way to describe the experience is to compare it to opening my oven to the warming smell of Christmas. I swear, there is no other smell like this. I was also as giddy as a kid on Christmas as I watched the french toast bubble and bake. Once I silenced the obnoxious timer and removed the piping hot french toast, it was time to add the Pièce de résistance (AKA: the syrup). 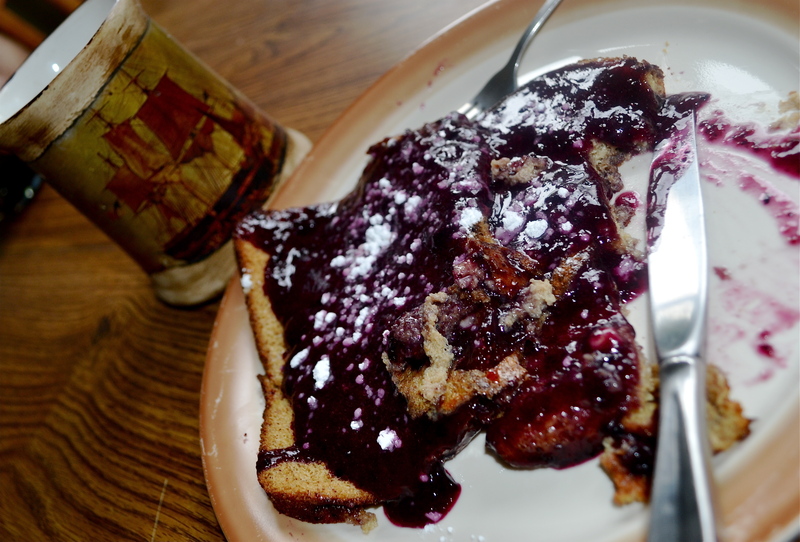 I drizzled the sugary syrup over the steaming french toast, sprinkled some more powdered sugar on top and it was ready to be devoured—which it most certainly was. There was something so peaceful about sitting at my dining room table on a Saturday afternoon, enjoying french toast like I did when I was a child. It made me long for home once again. I don’t care what Thomas Wolfe says; you can most certainly go home again. And next time I do, this recipe will surely follow.